1 Small Gift Bag 7 7/8" x 9 3/4" x 4 1/2" - Tooled leather design with stitching accents. It's made of heavy gloss finish paper, has cardboard bottom insert and string tie To/From tag attached onto the cord handle. 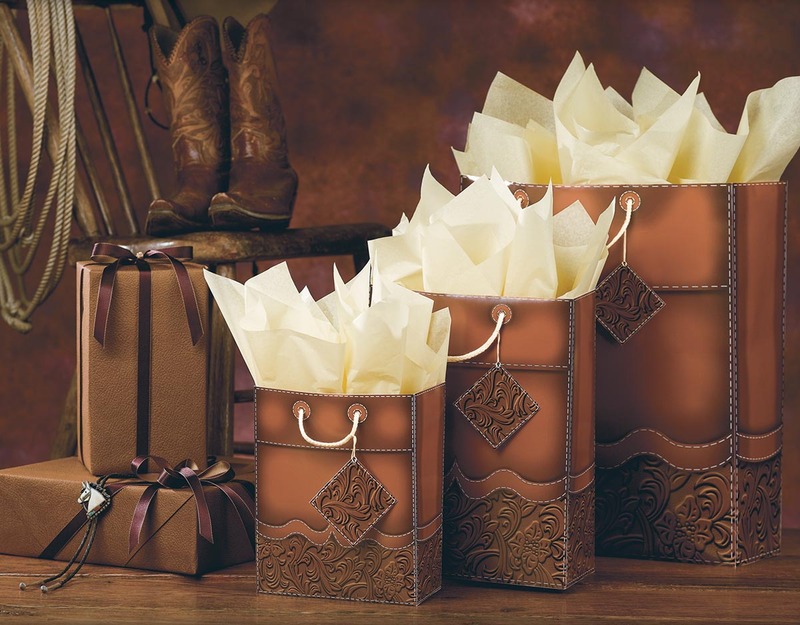 1 Medium Gift Bag 14" x 11" x 5" - Tooled leather design with stitching accents. It's made of heavy gloss finish paper, has cardboard bottom insert and string tie To/From tag attached onto the cord handle. 1 Large Gift Bag 16" x 19" x 6" - Tooled leather design with stitching accents. It's made of heavy gloss finish paper, has cardboard bottom insert and string tie To/From tag attached onto the cord handle. 2 Ivory Tissue Paper Packs 5 sheets of 26" x 20" each. 2 Rolls of Grosgrain Ribbon 5/8" wide x 5 yards each - Tan with red edging, has wire inside edges for extra shaping effects. 1 Roll Brown Embossed Leather Wrapping Paper 24" x 7 1/2' - Brown embossed leather look heavy paper. These awesome gift wrap collections were designed by a lifelong horse owner, whose career happened to be in packaging design - so all the details are just right! Each assortment includes 8 pieces; everything you need to wrap up a hoard of gifts in horsey style.